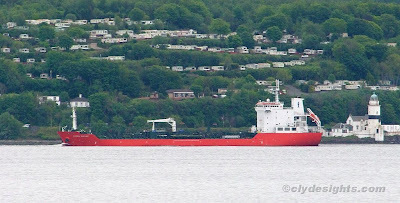 Another tanker belonging to Marida arrived at Brodick early on Saturday morning, and spent a couple of hours at anchor before heading upfirth. MARIDA MALLOW was delivered in August 2008 from the Sekwang Shipyard in Korea to OMCI Germany, and she operates as a member of the small tanker pool for the Heidmar Group while her technical management is entrusted to W-O Shipping. She is 128.6 metres in length, and with a deadweight of 13,160 tonnes, was carrying a cargo of petroleum products from Brunsbuttel in Germany.